It’s a jam-packed episode, as we dive deep with Jordan Peele’s incredible new horror film, Us, Jonathan gives some early thoughts from a pre-screening of DC’sShazam!, Sean shares initial impressions of FromSoftware’s Sekiro: Shadows Die Twice, and so much more! 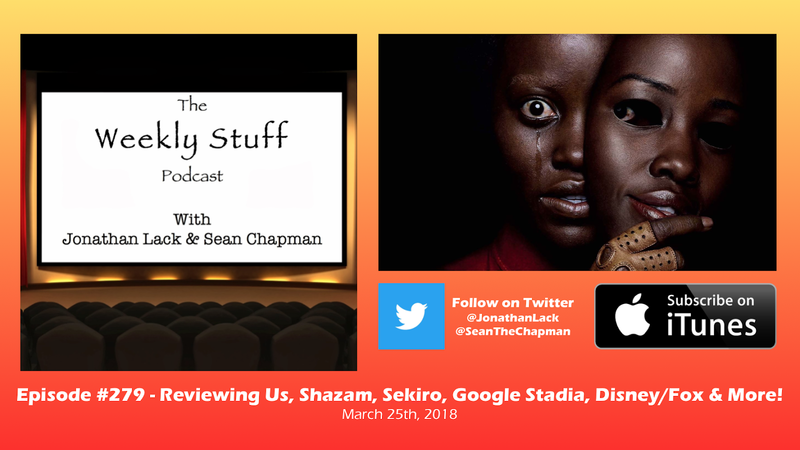 Sean also talks about playing the first three Devil May Cry days on some Colorado snow days, Jonathan reviews the documentary Apollo 11, and we cover a bevy of news, including Google’s new Project Stadia streaming platform and the realization of the Disney’s Fox acquisition. Throw in some listener mail and a gush-session over the new John Wick 3 trailer, and you’ve got one of the most fun episodes we’ve recorded this year.